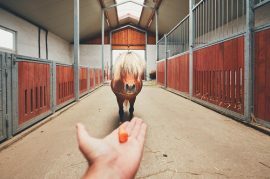 Some horse owners will tell you that it’s better to avoid offering treats to their animals and instead offer simple positive reinforcement via pats on the neck or scratches on the mane. However, others stipulate that an occasional treat to go with their regular grain, hay, or grass won’t cause any damage, so long as the horse doesn’t become spoiled or aggressive every time they smell their favorite treat. If you think your horse would enjoy something tasty just for him, then he might like these homemade Manuka honey carrot treats. Before starting, preheat your oven to 350 degrees Fahrenheit on the Bake setting. In a large bowl, mix the oats, the Manuka honey, and the water together until it has blended well. Heat the mixture up in your microwave for about two minutes in a microwave-safe bowl. Add the chopped apple, the chopped carrot, the brown sugar, the flour, and the crushed peppermints into the mixture and stir until it has blended together well. Microwave the mixture again for about two minutes. Using a mini-muffin tray, spray the individual cups with cooking spray before pouring the mixture into the cups. Bake the treats in your oven for roughly 15 minutes or until a toothpick inserted into the center of the treats comes up clean. Allow the treats ample time to cool before serving them to your horses, serving at your discretion for occasional rewards or simple treats. Feel free to store them in an airtight container for up to two weeks or freeze them for up to three months. Note: Remember these honey carrot treats in no way substitute regular meal times for your horses. Need to order some Manuka honey to make these treats? To get your order started, click here. And, remember, we offer FREE shipping on all orders of $150 or more.